The season of Lent offers us the invitation to go deep in faith and to confront the shadow side of our faith. We’ll take up several of the shadows this season, trying to understand what they can teach us about ourselves and our God. This Sunday, we contemplate the Shadow of Emptiness. Facing our fear of empty pockets, empty bellies, empty schedules, perhaps even empty faith, and our propensity for filling up with food that does not satisfy and activity that distracts us, we clear a space to imagine the gift that emptiness might bring. Join us Sunday as we these face this shadow together, in the hope that by so doing, we might grow deeper in faith and closer to God. This Sunday, we face the shadow of fear. Though our personal fears are as unique as the stories and experiences that have shaped us, all of us struggle to follow the command repeated hundreds of times in scripture...“Do not be afraid.” Fear is a natural human response to the uncertainties of life. The invitation and challenge of faith is not to avoid our fears or steer clear of storms, but to anticipate the transformation that waits on the other side and remember the one who journeys with us even, especially, when we are afraid. This Sunday, we take up the shadow of doubt. All of us experience moments, or whole seasons of life, when uncertainty of some kind overtakes us. We find it difficult to trust others or to embrace the promises of God. Like our faith ancestors, we spend some time in the wilderness asking difficult questions. Is the Lord among us…or not? These wilderness intervals can be difficult to endure, but they might also offer us a powerful gift. In the shadow of doubt, we can see ourselves more clearly, embrace our humanity, and discover the deeper promise of grace. This Sunday, we encounter the familiar shadow of weariness. Even as our faith calls us to rest in God’s grace, every other part of our lives demands busyness, increases stress, encourages overcommitment, rewards restlessness, and leaves us feeling weary in body, mind, and spirit. How can we hear the words of Jesus, “Come to me, all who are weary and heavily burden,” as an invitation to us? How can we let go of our burdens and welcome the gift of rest? Join a community of fellow strugglers this Sunday at Second! This Sunday’s shadow is guilt. The truth is that most of us have a complicated relationship with this deep-rooted emotion. While feelings of guilt can lead to reconciliation, repentance, and positive change, most of us tend to get stuck in the debilitating stage. And the Christian community’s emphasis on guilt can sometimes overshadow the deeper gift of God’s grace. If you’ve been carrying regrets for too long, need to hear the refreshing promise of grace, or want to move beyond the shadow of guilt into the light of forgiveness, join us this Sunday at Second! By the time you receive this publication, the church will be entering the liturgical season of Lent. Each year, Christians all over the world observe this six-week (forty days not including Sundays) period of reflection, discipline, and preparation for the celebration of Easter. Lent at Second begins on March 6 with a solemn Ash Wednesday worship service and culminates with joyful worship services on Easter Sunday, April 21. The communal worship of God is central to everything we do at Second, so it is fitting that this holy season be framed by meaningful services of worship. On Sunday mornings throughout Lent, we are contemplating some of the shadows of our faith and our lives, asking ourselves what it means to be Living in the Shadows. Our hope is that in facing these shadows together we might grow deeper in faith and trust in God. I hope that you will make plans to be in worship in the coming weeks! In addition to the centrality of worship, the season of Lent also calls us to deepen our commitment to God through prayer, study, and mission. This edition of the Spire and our Lenten devotionals contain information about opportunities to serve God with heart, mind, and soul. This Lent, perhaps you will consider finding a new way to get involved in the life of your congregation. If you are able to do nothing else, I hope you will carve out a few moments each day for prayer, the primary practice of Christian faith and the most important discipline of the Lenten season. Even amidst the busiest of schedules, we can all take time for prayer and reflection. The power of this communal journey toward Holy Week and the cross is its ability to transform and reorient our perspective. The scriptures of our faith tradition give us new eyes with which to see the world. The season of Lent can have that same effect on us, if we choose to embrace its call to reverence, dedication, and reflection. We might find ourselves refreshed and renewed by practices of worship, mission, study, and prayer. We might learn something new about ourselves, our neighbors, and our God. 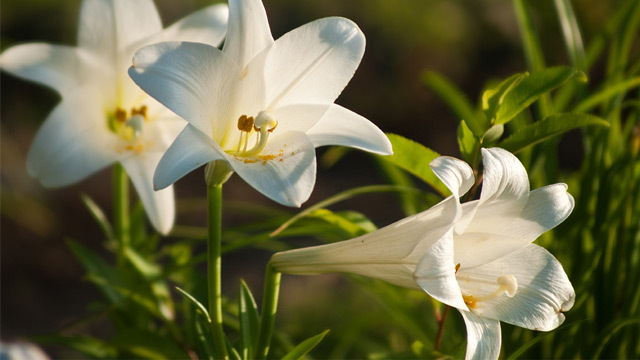 Most importantly, we will be prepared to hear and receive the good news on Easter morning, and to share that news with a world in deep need of truth, grace, and joy. The Lenten season is experienced in the shadow of the cross as it extends backward in the Gospel narratives and the liturgical calendar, drawing Jesus and the church toward its grim conclusion in Jerusalem on Good Friday. The execution of Jesus by Roman crucifixion is the ultimate manifestation of divine love for the world. Of course, we know that this is not the end of the story as we anxiously await the celebration of promised resurrection on Easter Sunday. In the midst of our joy (Christ is risen! ), we can be tempted to think that the story has ended. However, the shadow of the cross does not disappear on Easter. Instead, it is cast over all of human history ever since that first Good Friday. The cross is not the end, but the beginning. In the words of theologian N. T. Wright, Good Friday is the day the revolution began. The church is sent into the world by the crucified and resurrected Jesus to live in the shadow of the cross by continuing his mission of proclaiming and establishing the Kingdom of God through cruciform lives of love, humility, forgiveness, and service for the sake of others. Guilt takes on different shapes and sizes. The guilt of not following through with what it was you told someone you would do, the guilt of not caring more, doing more, or the guilt of doing something that you know you shouldn’t have. In thinking about guilt, shame follows closely. Hiding yourself from the reality of what it was you have done. Keeping that thing hidden from the public eye. The Psalm text today meets us in our pit. It walks up to us as we hang our head in our hands asking ourselves “why?” and pulls our hands aside. The scripture looks us in the eye and reminds us that “as far as the east is from the west, so far God removes our transgressions from us.” God’s love for us frees us from our guilt, and echoes over and over again that we are God’s beloved children. Nothing can take that away from us. In this Lenten season, my hope is that you might reveal to God what it is that might be bringing forth feelings of guilt. Allow yourself to share with God why, and open yourself up to the movement of the Spirit. Raise your head with confidence and rest assured that nothing can separate you from God’s steadfast love. In both Greek and Hebrew, the biblical word “weary” has an agricultural flavor to it. “Worn out” or “tired” doesn’t quite encompass the definition: it is the type of tired we would experience after a full day of working the land. In scorching heat, without the benefit of advanced tools or machines, sowing and reaping a harvest was (and in most ways still is) a back-breaking, exhausting way of life. If physical exhaustion seeps into our muscles and our bones, weariness seeps into our spirit. Like working long days in a field, it uniquely impacts the way we experience the world. Not all at once, mind you. Day by day, month by month, labor and circumstances can lead us into darker places than we anticipated. Dysfunction within a marriage, tension between siblings, the death or illness of a dear friend, stress at work or lack of work altogether, financial strains, loneliness, and spiritual famine: It is enough to exhaust anyone. It is more than enough to make us weary. In this season of Lent, take comfort knowing that Jesus has a word to say to those who are weary. Faith itself can begin to mend wounds that cannot be healed otherwise. A community of faith, at its best, serves as a place of rest and restoration for weary spirits. In our weariness, may we trust that we are known by our Creator, and that God’s love never lets us go. As Lenten shadows descend, hope will be the final word. I believe the arrows above should instead point in the same direction. Asking questions of God is what people of faith do. “Why do you hide your face from me?” demands Psalm 88. “Teacher, do you not care that we are perishing?” the disciples plead in Mark 4. To doubt is to question, and to question is to learn. Asking questions is one of the best ways I’ve grown in my own faith. Questions drive us to dig deeper into Scripture, to talk with pastors and Christian friends, to join Bible studies, and to pray. Through them we open our hearts and minds to see more clearly how God has worked and still works in the world today. Doubt and faith do not point in opposite directions. They work together, moving us to greater understanding and love of the One who does not condemn us for our questions/doubts, but rather delights in them as milestones of relationship. Have you ever lived through a destabilizing storm? The gale winds blow, the driving rain seems to almost fall sideways, and the skies are dark and foreboding. Strong storms awaken both fear and reverence. Whether you have lived through a literal squall that devastated your home or the figurative storms of relationship tsunamis, the pounding waves of financial hardship, or the flood of emotions that comes from a life-altering illness or the passing of a loved one, the storms of life can challenge our faith and fill us with fear. Psychologists claim, that along with happiness, anger, and sadness, fear is one of our core emotions. Fear and anxiety are primitive survival responses to whenever we feel our body and soul are in real or perceived danger. In our scripture lesson for this week, we read how the sea-worthy fisherman/disciples were fearful due to the magnitude of the storm and the waves that threatened to overwhelm their boat. Having heard from Jesus only hours before about the trustworthy nature of God, their fearful, biologic responses caused them to awaken Jesus in desperation. But what if faith had won the day? What if they truly believed the boat wouldn’t sink and that the storms of life will pass! Fear in life is an instinctive response that sometimes grows into a state-of-mind that steals away our very life and soul. Our faith in God is what helps us to manage our storms of life and the cold winds of fear that too often rock the boat. Prayer: Heavenly Father, please quiet the wind and subdue the waves that threaten our stormy lives. Holy Spirit, make us bold to pray for the stillness to listen for the healing words of the Gospel. In Jesus’ name. Amen. “I am so distant from the hope of myself,” writes poet Mary Oliver in her poem When I am Among the Trees. Like the poet, we confess that our shadow sides cling closely to us, growing so large sometimes they overwhelm us. In Lent, through prayer, fasting and service, we seek to empty ourselves. We empty ourselves to make a space so that God might come in. So that God might bring us back to be the people God created us to be. This is hard. Because emptiness and hunger frighten us, we seek to fill our days with activity, our bellies with food, our houses with stuff, our resumes with achievements until we have found that there is little room for God, and we are far from the hope God has for us. March 13 - April 10, 6:30 p.m. In Lent, we make space in our lives for God. We pause for practices of prayer, repentance and service. As Christians, when we make time and space for one another, we make space for God. When Christian hospitality is practiced, both host and guest are blessed! 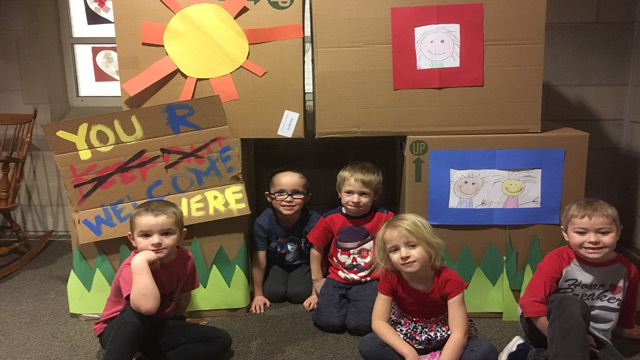 Story, games, crafts and hands-on mission “bring the lesson home” at Wednesday Night Kids Club. At this service of shadows, we share the Last Supper and hear the story of the last hours of the life of Jesus. The service ends in darkness. Meditations are held in the chapel on the Seven Last Words of Christ. Please feel free to come and go as you are able. This service features hymns, vocal and instrumental music interpreting each word. Morning worship services: 8, 9:30 and 11:15 a.m. Sanctuary Music at these services features special music with Sanctuary Choir, Festival Brass, organ and percussion. Prelude begins 20 minutes prior to each service. Evening worship service: 5 p.m.